Becoming an animal keeper is the ideal job if you love animals. My passion for them is in my blood as my grandparents worked at Woburn when I was a kid and my mum and dad still work here. It’s perfect if you’d rather be outside come rain or shine, rather than sat behind a desk. No two days are the same. On any typical morning I could plan to get through a pile of paperwork, but instead find myself torn away to deal with an animal who needs the vet. My role means I’m responsible for all the animals in my section, and I also spend a lot of time mentoring and guiding my staff, passing on what I’ve learnt and helping to develop their skills. As the animals need 24/7 care it’s not your typical nine to five job, but I’m very lucky to have understanding family and friends who know I love what I do. I never anticipated the strength of the bond that’s created with the animals in my care. My happiest moments as a keeper have been when I’ve helped animals come into this world. I’ve been at so many births, but it never gets old or boring. My saddest moment was when I first left Woburn. I didn’t just leave such a beautiful place to work, but I was also saying goodbye to family, friends and of course the animals. After 15 years away, I’m delighted to be back. As corny as it sounds, my role model is my father, Chris Freeman, who is Woburn’s Animal Development Officer. I was very fortunate to have worked alongside Dad for over 18 years before I left Woburn the first time, and I’m now back working with him again. He has been a mentor for me throughout my career and has taught me the ins and outs of working with large and dangerous exotic species. My field of work is equal opportunities and it’s a great job regardless of gender. You see many women working with animals in zoos and safari parks today. At Woburn it’s about 50:50 men and women in head of department roles. 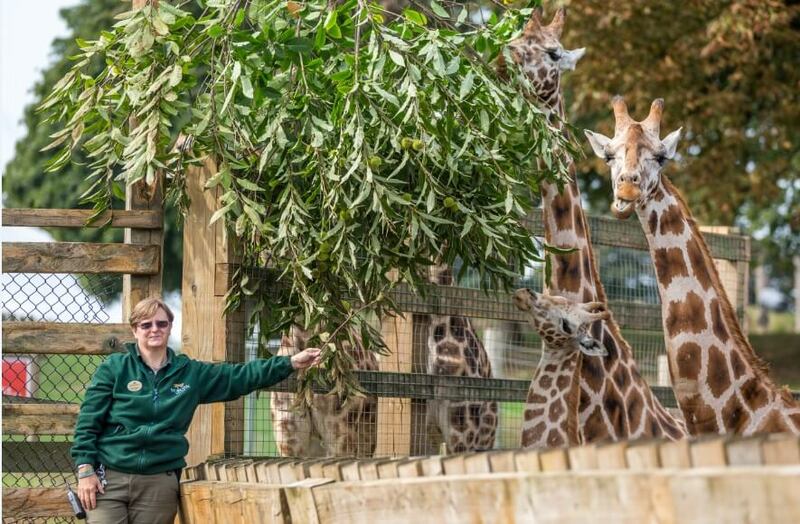 When I first started working here in 1986, I was the youngest female head of section for what is now the Animal Encounters section. To become an animal keeper you’ll need at least five GCSEs, including English, maths and science, work experience with animals and a qualification in animal care or animal science. Sometimes you can get an apprenticeship. I have a Higher National Diploma in Farming and Zoo Management, a tractor and trailers licence and a forklift licence among other qualifications. Buy your tickets online at woburnsafari.co.uk to access discounted web-only prices.